A court has rejected a bid to close down a Rastafarian temple suspected by police of being a drugs den. The 32-room property in St Agnes Place, Kennington, south London, was raided in April after worshippers complained it had been taken over by drug dealers. Quantities of cannabis, some crack cocaine and ammunition were found inside, said police. But Camberwell Green Magistrates said there was not enough evidence to prove the temple had become a crack den. Despite the ruling, the premises are due to be closed down on 16 May in an agreement reached between the occupants and Lambeth Council. A council spokesman said the occupants of the building had voluntarily agreed to hand over the property. "We are currently considering with worshippers a number of alternative sites for relocation," she said. The temple is the last standing building in a site which has long been earmarked for redevelopment. Ch Supt Martin Bridger said the police investigation supported that Class A drugs were being supplied from the premises. "However, the court ruled that the link to Class A drugs was poor and the application was not granted," he said. "We must respect the decision of the court." 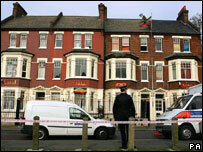 Twenty-three people were arrested following the raid by about 250 officers on 12 April. Police claimed the site, seen as the focal point for the UK's Rastafarian community, was receiving up to 600 visits a day, mostly for drugs.